(2) Use our fun and easy-to-use "Guru Guide" to find the Guru right for you! 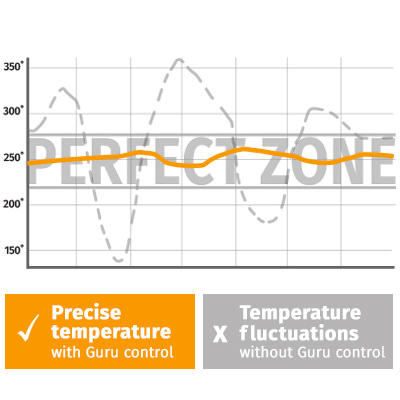 (3) For the advanced user, build the components of a custom Guru Control kit. 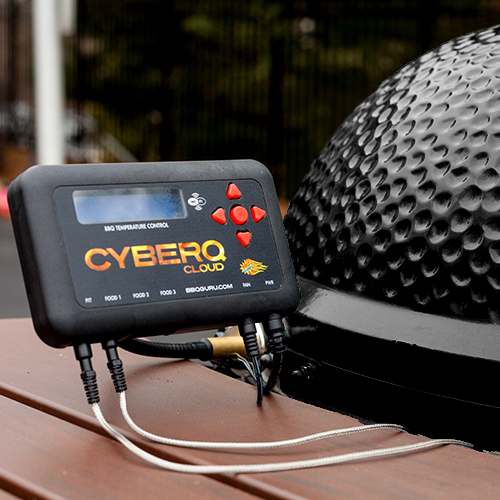 As our newest and most high-tech temperature control, the CyberQ Cloud is the future of BBQ’ing. Whether you are next to the CyberQ or across town, it solves the two most common problems of cooking outdoors: regulating your grill’s temperature and accurately monitoring your food temperature. The new CyberQ Cloud comes with a new more powerful processor and increased memory to deliver tons of new features when compared to the previous model. 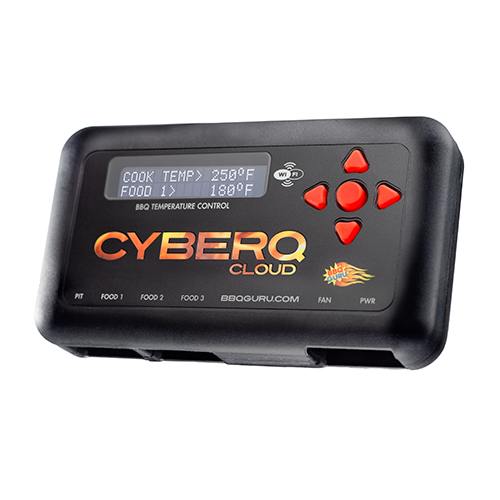 The CyberQ Cloud constantly and automatically regulates your cooker’s temperature. 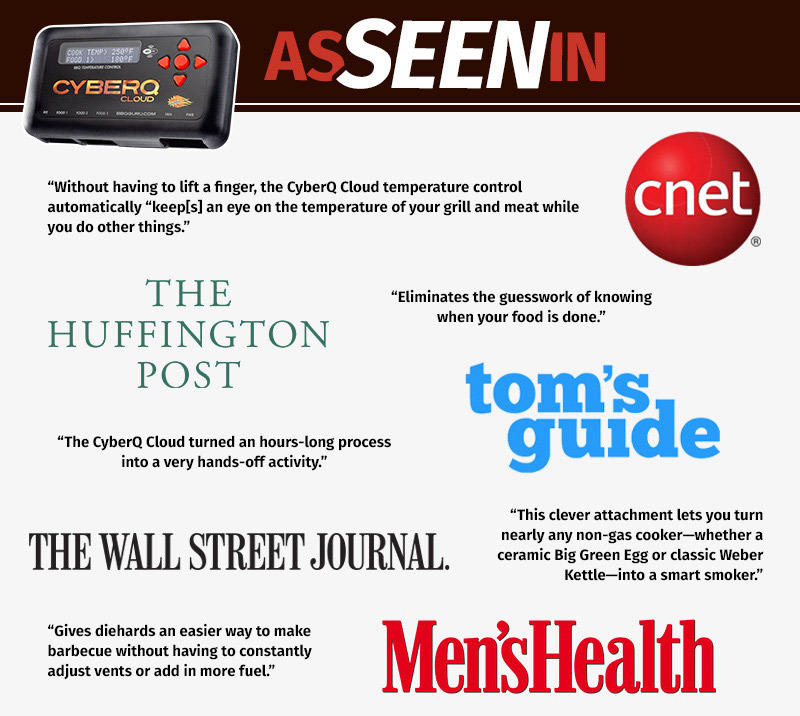 It does the work for you-- giving you the freedom to entertain your guests while the CyberQ Cloud diligently tends to the fire. The CyberQ Cloud allows BBQ’ers to track and record their cooking projects using our dedicated sharemycook.com website, even sharing techniques and recipes with others on social media. 4. Plug the fan into CyberQ Cloud and power it up with the AC adapter. A key feature of the CyberQ Cloud is its WiFi capability. You can monitor AND control your CyberQ Cloud remotely from any web-based device such as your smartphone, tablet, desktop, or laptop. The CyberQ Cloud easily syncs up with the fun and easy to use ShareMyCook website to monitor, control, and record your cooks from your computer, tablet, or WI-FI enabled smartphone. Join the BBQ Guru community and start watching and controlling your cook’s temperatures in real-time and record them to review later. Create and share recipes with other CyberQ Cloud owners, upload your delicious food shots, and support others by commenting and rating other cooks. 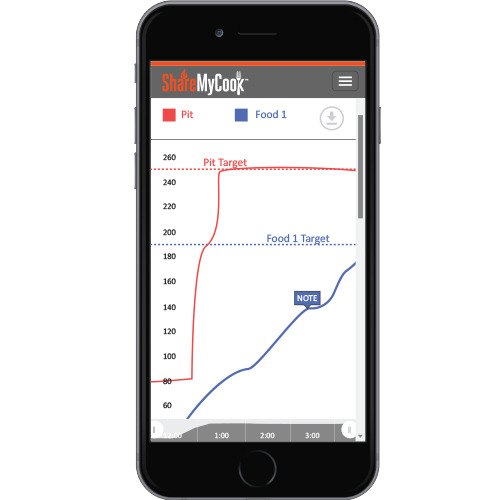 Use ShareMyCook.com to graph and monitor your pit and up to 3 food temperatures in real-time from the browser on your phone, laptop, tablet, or desktop. Set and watch your target temperatures, plus make notes at key moments of your cook. By closely tracking your cooks, you will be able to make more consistent delicious BBQ. Share your delicious cooks and tasty recipes with friends and family across your favorite social media platforms like Facebook and Twitter. Don’t want to share your secret cooking techniques with the world? Make them private or password protect them to share only with your closest friends. Need a little extra help with your grill or smoker? With the addition of an Amazon Alexa-enabled device (required to use this service), you can use voice control to monitor and control your cooking temperature and food target temperatures while your hands are full with other tasks. You can give Alexa commands or ask questions like, “Alexa, ask CyberQ Cloud, what’s the temperature of Food 1?” or "Alexa, tell CyberQ Cloud, set the pit temperature to 250." Why controlling your cooker’s temperature is important. Why is food temperature monitoring important? Open lid. Check temperature. Close lid. Open lid. Check temperature. Close Lid. 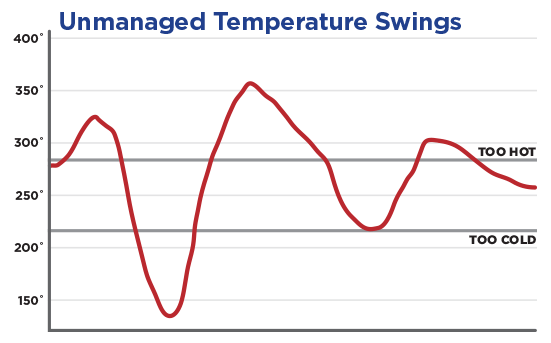 This is what happens when we are so worried about overcooking our meat that we constantly check it, actually causing undesirable temperature fluctuations. Because the CyberQ Cloud’s digital thermometers constantly track your meat’s internal temperature, it eliminates the guesswork of knowing when your food is done. That means you can pull your food off the heat at the exact moment it reaches its peak of perfection. Simply set your “food ready” temperature on the control, and it notifies you when your meat is done by audio alert, e-mail, or text message (standard text message rates will apply). Want to watch the big game, hang out with friends, or play with your kids, but feel anxious about the need to babysit your BBQ? Don’t worry! Check your cooker’s temperature and all your meats’ temperatures on your web-ready devices. Some BBQ recipes require you to adjust the level of heat in your cooker at different stages of the cook. But what should you do if you’re shopping, for example, and need to change the cooker’s temperature while you’re out? Don't worry. Just pull up your smartphone, connect to ShareMyCook.com, make the adjustment, and it will automatically change to the new setting for you.Never before has so much control of outdoor cooking on charcoal and wood been possible! Activate the “Ramp Mode” feature and the CyberQ Cloud will detect when your food is approaching its “done” temperature. It will then slowly ramp down your pit temperature to help you achieve moist, tender and maximum flavor while minimizing the chances of overcooking. Use the “Open Lid” feature to minimize the chances of temperature spikes after you open the lid of your grill. When you open your grill’s lid, it will cause a quick drop in temperature. Without Open Lid detection, the CyberQ Cloud would normally start stoking the fire thinking it needed to raise the temperature. This can overheat the coals so that when you close the lid, you could get a temperature spike. 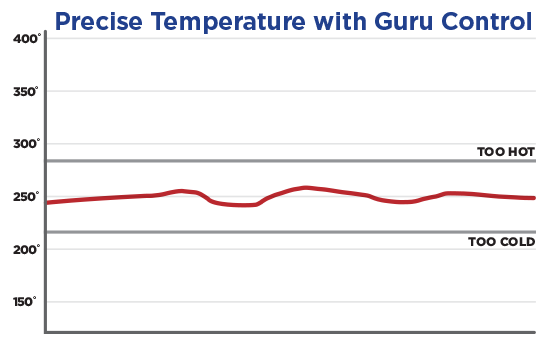 The CyberQ Cloud’s built-in algorithms can detect this with Open Lid detection. It then automatically minimizes temperature disturbance and gives you better accuracy for your desired cooking temperature. Because of the variety of cookers and grills on the market, we sell several different varieties of kits that make it easy to install the CyberQ control. At the top of the page, select your cooker’s make and model, and you’ll see what kits are compatible. If you don’t see your grill on the list, select “other” from the drop-down, and tell us the make and model of your grill. Our customer service team will respond within 1-2 business days to let you know which CyberQ kit is best for you. PartyQ – Portable and great for those lives that are on-the-go. Because the PartyQ runs on AA batteries, it is fantastic for controlling cooker temperature when camping, RV’ing, tailgating, or just cooking in your backyard. DigiQ – Controls cooker AND includes an integrated digital food thermometer. Alerts you when your food is ready. Don’t own a grill or smoker yet? Check out the Monolith BBQ Guru Edition for all your grilling, barbecuing, baking, smoking, searing, and roasting needs. It’s the complete outdoor kitchen!